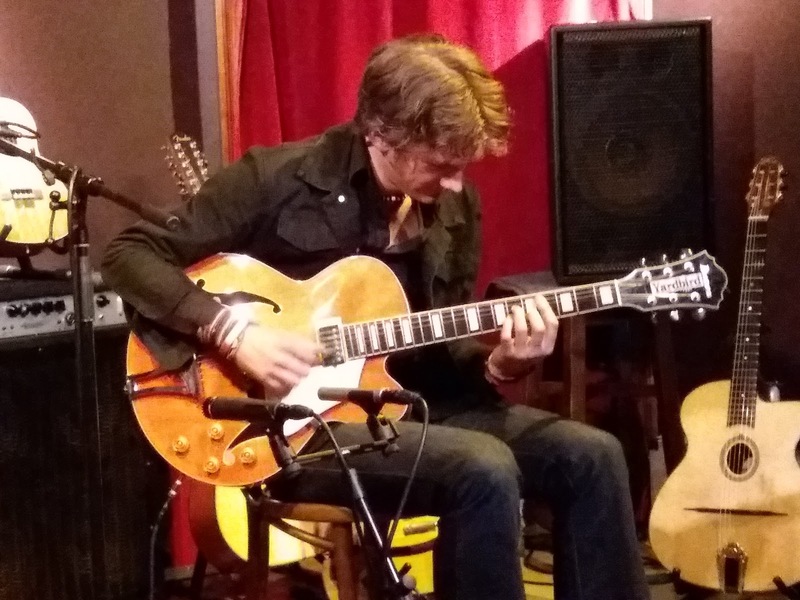 Some eagerly anticipated gigs meet or exceed expectations and this first Newcastle appearance by Remi Harris ticked every box. Guitarist Harris arrived in good time with rhythm guitarist Caley Groves, bassist Mike Green and tour manager Dani Harris. The trio set up, sound checked, then, perhaps, went for a wander. Whatever their pre-gig routine they were on the premises in time for the first of two sets beginning at eight o’clock. The upstairs room of the Jazz Café on Pink Lane proved the ideal space; Remi’s array of guitars (see photos) sparkled under the stage lights as the trio relaxed on sofas (Caley and Mike), Remi preferring a basic chair and, perhaps tellingly, with guitar in hand. 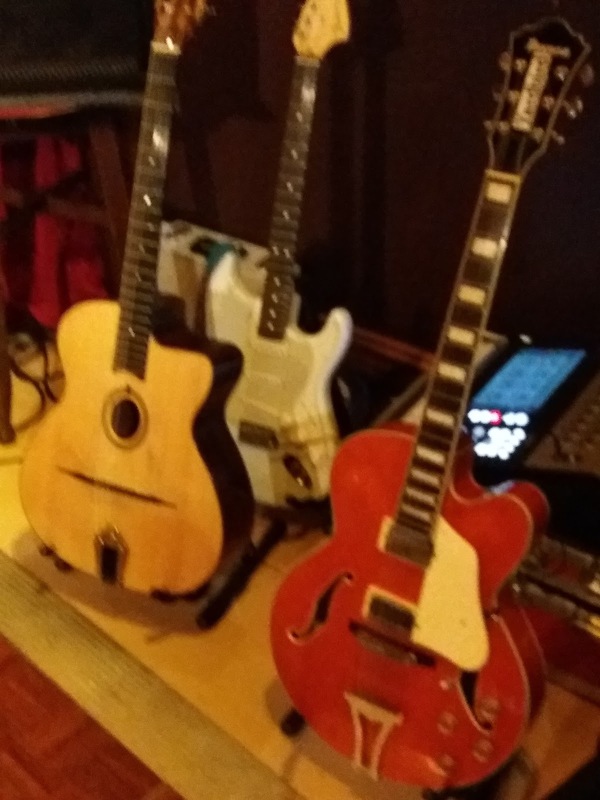 One imagines that our guitarist from rural Worcestershire is rarely without one of his guitars. Is he a guitar obsessive? Probably! This would go some way in explaining the remarkable talent of a young man who appeared to be rather shy and for the first twenty minutes or so Harris let his guitar do the talking for him. Introductions would follow but for now, the music spoke; a few bars of All the Things You Are then into Can’t Buy Me Love. Harris is known as a ‘Hot Cub’ or ‘gypsy jazz’ guitarist, yet there is more, much more to him than that. Yes, Django is a key figure, as is Wes Montgomery, and a mean low down blues is in Harris’ locker, as is a ukulele! 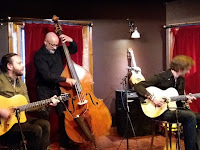 Caravan’s double swing time sections – Caley and Mike were all over it – showcased the trio’s near-telepathic understanding, scarcely a glance such was the trust between them. Remi conjured – it was as if by magic – an amazing intro to Pennies from Heaven and, as we were to discover, he has a penchant for a fleeting quote, on this number Percy Grainger’s Country Gardens. The Meters’ Cissy Strut worked well alongside Nature Boy (the latter featuring one of many fine solos from accomplished bassist Mike Green) as Remi switched from his beautiful Maccaferri (obtained from a luthier in Cumbria, rhythm guitarist Caley acquired his own equally fine Maccaferri in Paris) to powder blue Strat to a twelve string to a Les Paul for a Peter Green homage playing Need Your Love So Bad. From time to time Harris utilised a pedal board to good effect yet it was his sheer virtuosity which transfixed an attentive audience. The setlist was in the heads of all three musicians, a written setlist wasn’t required and the breadth of material was no doubt designed to maintain interest – their interest and that of the audience. More from the Fab Four – Here, There and Everywhere – and a quite amazing ukulele/double bass rendition of All of Me and as the evening progressed the main man opened up to the audience talking about his many guitars (the Jazz Café resembled a guitar shop…home from home for Remi as he used to work in one!) and the development of his chosen instrument. Remi name-checked French guitarist Dorado Schmitt suggesting he was an important bridge between Django’s era and the many Hot Club guitarists of today. 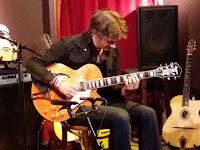 Fittingly the Remi Harris Trio played Bossa Dorado.